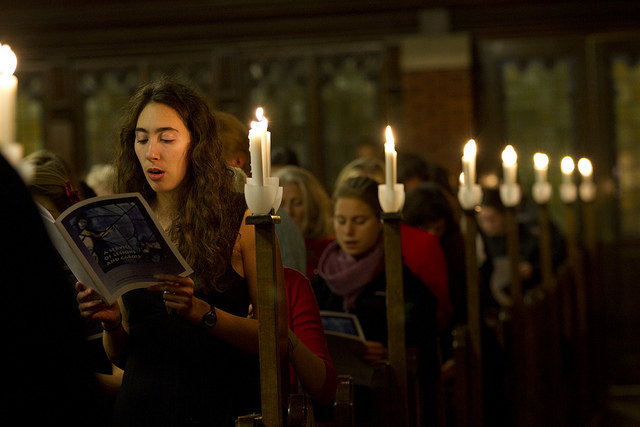 Bates holds its annual Service of Lessons and Carols for the Advent season of the Christian faith at 7 p.m. Sunday, Dec. 8, in the Peter J. Gomes Chapel, 275 College St. Sponsored by Bates’ Multifaith Chaplaincy, the service is open to the community. For more information, please call 207-786-8272. Bates’ Service of Lessons and Carols draws on the traditional structure of the Festival of Nine Lessons and Carols, telling the story of the birth of Jesus through traditional readings from Scripture mixed with contemporary prose. Christmas hymns and musical performances by college vocal and instrumental groups round out the service. The service will be led by Acting Multifaith Chaplain Emily Wright-Magoon and Acting Associate Multifaith Chaplain Raymond Clothier. Musical performers will include the Three Point Jazz Trio, Chase the Fiddlers, the College Choir, the Gospelaires and several a cappella ensembles: the Crosstones, the Deansmen, the Manic Optimists, the Merimanders and Take Note.